Three years ago, when I was playing my first “for real” Dj set with the opportunity of a New Year’s Eve on the Pacific coast of Mexico (Puerto Escondido to be precise), I had the chance to meet The members of a crew called NAAFI, with whom, I found myself warming up for without even knowing. NAAFI is an organization based in Mexico City, whose founders are Tomás Davo (aka Fausto Bahía) and Alberto Bustamante (aka Mexican Jihad) supported by Paul Marmotta and Lauro Robles (aka Lao). NAAFI is dedicated to promote what they call “peripheral rhythms” (“Ritmos periféricos” VO) on The Electronic Music Dancefloor. To be clear: NAAFI started making parties where they decided to mix “everything revolving around the mainstream, but that is not mainstream” like they said. Thus, little by little, NAAFI has become a reference in The Underground Electronic Music (and not only) promoting local producers and Djs wishing to showcase their version of electronic music. 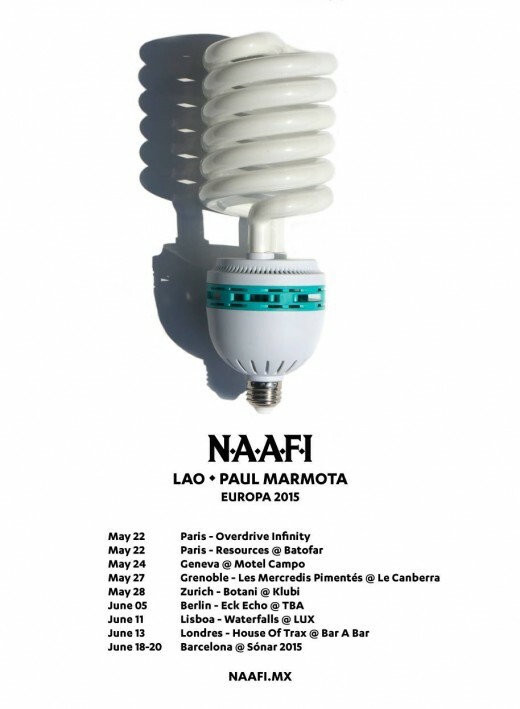 From event organizers, NAAFI became a label, and recently has begun to take care of booking for artists significant to the “NAAFI sound”, that brought them to a one-month US tour last September and a first Europe Tour May – June 2015. NAAFI’s events videos are always very creative. NAAFI began as a label in 2012. The first publication was a vinyl from Chilean rapper Jamez Manuel (member of the band Zonora Point), each track is co-produced by the French Douster (hey there King Doudou) and various Latin American producers. Consequently, there followed other physical EPs in 2013 and 2014: Siete Catorce, Paul Marmota, Lao and Smurphy last October. In parallel, the label has started a purely digital catalog and the first release was a really interesting EP, grime oriented, from Omaar titled “NO!” last December. Omvvr is a producer of the Estado de México (periphery of Mexico City). Last December, I had the chance to attend the conference given by NAAFI about their new release: NAAFI TRIBAL. A video interview is coming soon on Couvre x Chefs (filmed by Aldo So, from Mexico City), but before that, I want to go back more precisely on the disc in question. 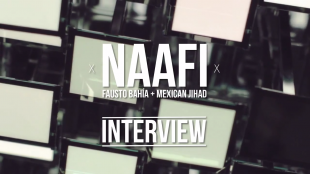 Regarding NAAFI TRIBAL, this project is part of a third catalogue managed by the Mexican label in collaboration with the Centro de Cultura Digital Mexico City. This catalogue which TRIBAL was the first publication, is dedicated to publishing outputs dedicated only to current music born in Mexico, in the form of compilations. So the first is a compilation of music from the tribal genre. BUT … WHAT IS TRIBAL? Tribal is a genre of popular music born in Mexico, specifically in Mexico City. This music has a rhythm that we could assimilate to accelerated cumbia rhythm close to techno (near 130 BPM, while “traditional” cumbia is rather below 100 BPM), and sounds blending local influences (cumbia, ranchero, congas and other Afro Caribbean percussions …) with sounds of electronic music. The first fruits of this kind of music go back to the tribal called “pre-Hispanic,” which include DJ Mouse as initiator, and whose sound is organic (flute, percussion). Tribal has gradually expanded about all Mexico, it has been listened to in all markets of the country and by region, tribal won different tones, creating subgenres of Tribal: Tribal Guarachero born in Mexico, the pre-Hispanic tribal previously mentioned, the tribal costeño from the region of Oaxaca and the Pacific Coast (Puerto Escondido) … the genre exploded in 2010 when the trio of very young producers 3Ball MTY (to pronounce “Tribal Monterrey”) was spotted by a renowned producer of the Mexican scene: Toy Selectah. This meeting allowed 3Ball MTY to sign with a record company and to see the release of their album legally on the national and international market (major hit in the US); we should recall that this music was previously sold on pirated CDs, on the markets or in the subway, with no real credit and even fewer copyrights… by the way it’s still the case for a lot of tribal releases. Thereafter, you can see the video clip of their hit “Intentalo” that made the band famous in USA and Mexico few years ago. However, I want to insist that these kind of shoes come rather from San Luis Potosi foklore (center of the country) than the Nordic, where 3ball MTY come from. Selected by Javier Estrada. Javier Estrada has no less than 800 songs available on the internet, and has been experimenting on pre-Hispanic tribal for many years now, long before, that the “recognition”of the style and popularity gained by it today. His disc for the NAAFI TRIBAL compilation is exclusively composed of songs by himself, handpicked in his rich collection and mixed by himself. Selected by Alan Rosales. DJ Alan Rosales comes from the Iztapalapa District of Mexico City and is the son of a famous “sonidero” : Sonidero Marshall. Recall that “sonidero” is, in Mexican culture, a person who has in his possession a powerful sound system and a good selection of often popular music (salsa, cumbia …or High Energy but it’s another story) and that animates neighborhood parties. The sonidero is close to the DJ, I mean it in the occidental sense, but what differentiates the sonidero is his particular way to interact with the people: indeed, the sonidero still have a microphone and dedicates the songs to the people who, sometimes, ask him to play his favorite song. Well, Alan Rosales comes from Iztapalapa which is, with the Tepito neighborhood, the iconic neighborhoods of the sonideros culture in Mexico City. Alan Rosales produces guarachero type of tribal music, the characteristic style of Mexico City. The difference with pre-Hispanic tribal is that guarachero tribal doesn’t use Andean flute sounds but synthesizers for melodies. His compilation is a mix of his own material and other modern (“tribalized”) versions of classic Mexican music compositions. Selected by DJ Tetris. DJ Tetris, or Alejandro Triste, comes from the Oaxaca region, more precisely from Puerto Escondido, one of the most amazing places on Earth to me. Highly recognized, one might almost say that DJ T3tris alone is the tribal costeño. The DJ uses many traditional Oaxaca songs, and adds the tribal rhythm. Sometimes, some local groups specially compose instrumental parts for him on which he adds tribal rhythms. His compilation is therefore a mix of his own compositions and pieces of folklore “Oaxacan” “tribalised”. We may suppose that a big part of DJ Tetris tribal music comes from the folkloric music called “chilena” that is very popular in the Mexican’s states of Guerrero (Acapulco) and Oaxaca (Puerto Escondido, Pinotepa Nacional…). The name “chilena” comes from the immigration of Chilean people on the Pacific coast of Southern Mexico between this two states: The Costa Chica. Interview filmed by Aldo So. Traduction by Ryan Lavoine & Sándalo Alquitrán.